As a huge sports fan myself, one of my favorite sports to watch is hockey, and the only thing better than NHL hockey is NHL Playoff hockey. That’s why I was psyched when I got the assignment with NBC Sports to head down to Anaheim and shoot some player interviews with the Ducks who are the #1 seed in the Western Conference. We arrived at the Honda Center nice and early to start setting up. We used a simple black curtain with some jerseys hanging up as our background. 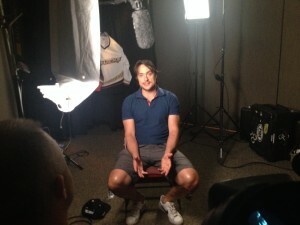 We interviewed several of the Ducks key players including 22-year veteran Teemu Selanne! We shot on the HDX-900 at 24p to get a real nice film look, and we used Nano Flash to be able deliver digital files for a quick turn around. 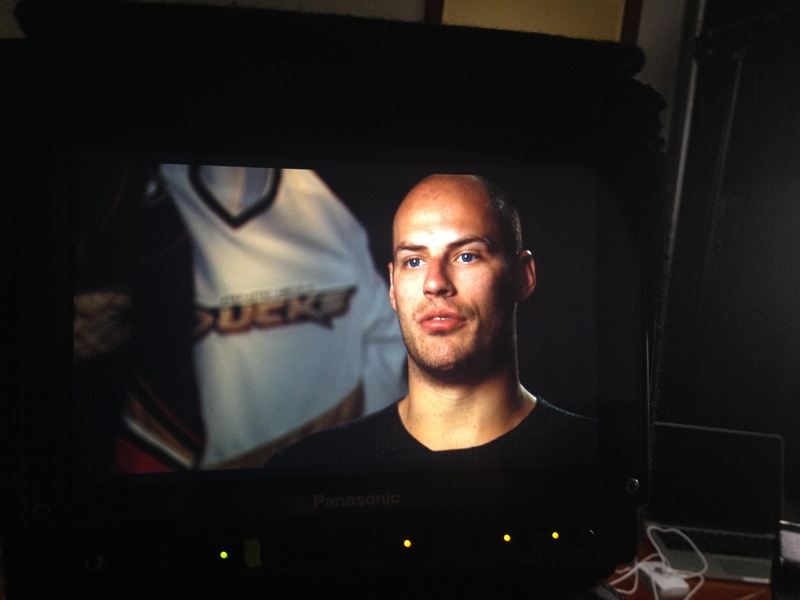 I wanted a more dramatic look to these interviews since we were talking playoffs, rivalries, and the Stanley Cup. I simply used a Diva 400 as a key light and a somewhat harsh back light with no fill for the side of his face. This created some darker shadows on the subject’s face. Once we finished interviewing the players for the piece I transferred the footage to a drive that was overnighted to NBC Sports so they could cut the piece in time for the start of the series. It was a fun shoot and great to be behind the scenes as the two teams gear up for some intense playoff hockey!